Joanne Therese Smoltz was born November 26, 1953 in Detroit, Michigan to parents John Smoltz and Theresa Gehringer Smoltz. She married Peter Sroka, Jr. in Allen Park, Michigan at St. Cabrini Church. 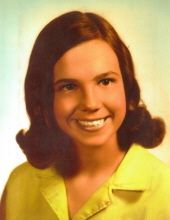 Joanne was a stay at home mom and loved watching old tv shows and coloring. She was preceded in death by her parents, John & Theresa Smoltz. Joanne is survived by her husband, Peter Sroka, Jr. of Breckenridge; one son, David Sroka of Detroit, Michigan; one daughter, Lisa Opel & husband Chad of Breckenridge; two grandchildren, Alyssa Opel and Anthony Opel. "Email Address" would like to share the life celebration of Joanne Sroka. Click on the "link" to go to share a favorite memory or leave a condolence message for the family.